In this blog post, we are going deeper into the tab ‘Projects’ of MyGDaaS platform. We address when you need to use ‘Projects’, how you can use it and what are the best practices. What are projects in Cloudalize? Cloudalize is a multi-tenant cloud computing platform, so you can create infinite levels of tenants and separate each project. ‘Projects’ are self-contained environments within your customer tenant. Within this project, you can create users, desktops, servers and manage their specific network details. For each tenant you can customize branding, set up security rules and configure blueprints for quick deployment. Moreover, you are able to see specific resource usage details for each project. The billing will still happen at customer level, so you don’t need to add billing details for each project. The tab ‘Projects’ in Cloudalize is only visible for admins. With ‘Projects’ you are able to separate users that are working on different projects who should not have access to each other’s data and work. For example, if you’re working on multiple building projects with different architects it’s useful to create several virtual ‘Projects’ so that the architects have access to software programs and information related to their specific project. This results in shorter lead times for overall building projects as collaborating teams are well-organized in separate projects and managed by the admin. In addition, each user in the project has real-time access to their software programs so they no longer have to waste time synchronizing data and waiting for IT support. 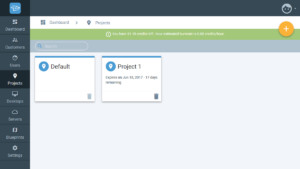 An overview of your projects can be found in the ‘Projects’ tab in Cloudalize. To create a project, select the + sign at the top right. During the creation of the project, you can follow the progress. This progress can take a few minutes, as we setup VPC, gateway and more to get you going. When the project is created, you can go to details. 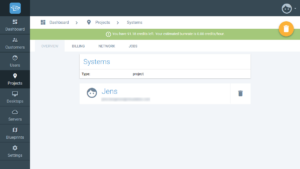 Here you can manage the project specific users and network details. 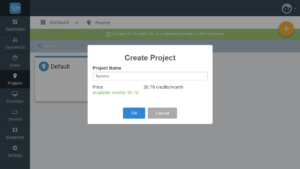 Enjoy creating projects in Cloudalize! Do you have more questions about projects or the platform in general? Write us on the chat available on this page or contact us here and we will be happy to help you!